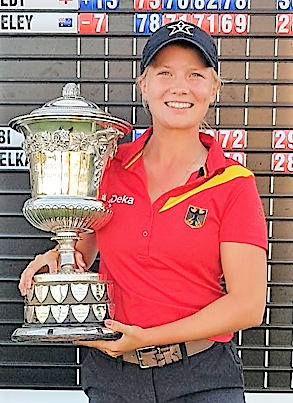 Germany’s Celina Sattelkau (pictured) has become the first overseas winner of the English girls’ open amateur championship, finishing on 10-under par 286 (74-72-70-70) at East Devon Golf Club. It’s the first big win for the 17-year-old, who was three shots ahead of her closest challenger, Kirsten Rudgeley of Australia, while Italy’s Maria Corbi was third on four-under. The leading English player was girl international Mimi Rhodes (Burnham and Berrow) who shot one under 73 and four-under 70 today, to finish on two-under for the championship. Sattelkau moved into the lead at the halfway stage of the championship and today she put her foot down, playing both rounds in four-under. “My start today was pretty good, I was six under after seven. My back nine wasn’t that good but I still finished on four-under. In the second round I was solid all the time, my long game was good and my drives were in the fairway,” she said. She was pleased with the way she dealt with the pressure of being in contention: “It’s my first real win so it’s pretty cool and I’m happy about the way I handled it.